If you are a resident if Fishers, Indiana, and you have a past arrest record, you may have a great opportunity to hide your record of general public access. The new expungement laws passed in Indiana allows individuals with arrests, criminal charges, or convictions to clear their criminal history. This new law will open up job opportunities and get more people back to work, repair driving records, eliminate the potential for lost job opportunities, let people feel better about themselves and their past, avoid public embarrassment, and so much more. Act Fast Before the Law is Gone for Good! Many interest groups and private organizations were (and still are) highly against these new laws, and has since faced considerable opposition. This very unpopular law may be repealed at any time, which means you need to take advantage of it while it’s still here! This is a once in a lifetime chance to clear your criminal history and move forward with a life you’ve always dreamed of living. However, not everyone with a criminal past will qualify. 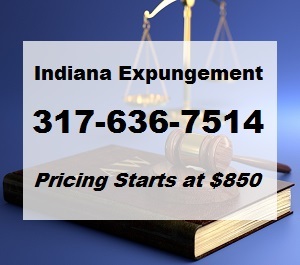 There are several factors that determine who is eligible to get their record expunged or sealed in Indiana. Misdemeanors, class D felonies, arrest records, and more can all potentially be eliminated from a person’s criminal history depending on the circumstances of their case. The type of conviction or charge and how much time has passed are two primary factors considered by the state. Filing for expungement on your own is never advised because the process is very complicated and confusing for someone unfamiliar with Indiana laws and procedures. On top of all the documents and papers that require proper filing, people filing for expungement can expect many more pitfalls and deadlines. In fact, one of the rules to expunging a criminal record is that a person can only file ONCE IN A LIFETIME. If a spelling error or similar minor mistake is made during the filing process, it could revoke your chance to expunge your criminal record, forever. For this reason, you need a licensed Fishers criminal record expungement lawyer who is well-versed and experienced with the new expungement laws. They can help you with every aspect of filing, paperwork, deadlines, and more, and ensure your petition is managed correctly. Call 317-636-7514 if you would like to petition for restricted access or expunge an arrest from your criminal record in Fishers, Indiana. We are happy to provide free initial consultations to discuss your case without any out-of-pocket obligations. And our rates start as low as $850! Whether you are looking to seal or expunge a criminal record, we are the criminal lawyers to trust for a hassle-free petitioning process. Take advantage of this opportunity in Indiana, and get your criminal record expunged this year! This entry was posted in Indiana Criminal Record Expungement and tagged Criminal Expungement Fishers Indiana, Expungement lawyer fishers, filing for Expungement Fishers, Fishers Criminal Record Expungement, fishers Expungement services. Bookmark the permalink.